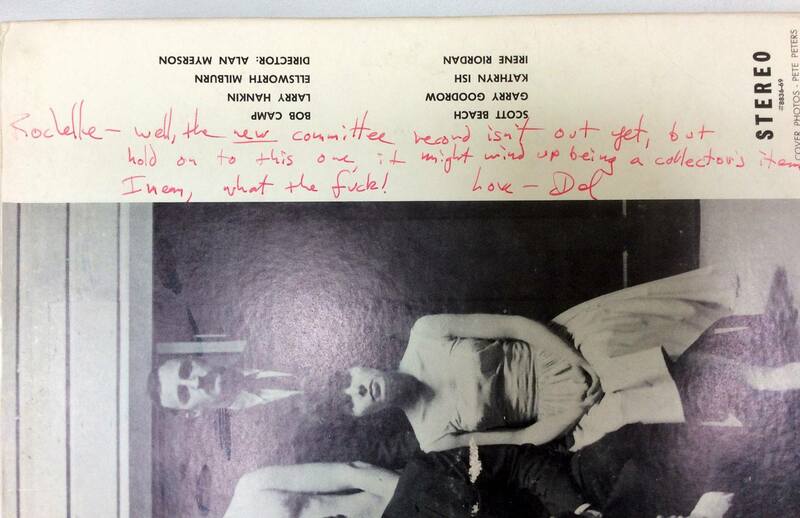 Sent to us by Julie Payne, this pic is of the back of The Committee’s first album, inscribed by Del Close to actress Rochelle Richelieu. It is in fact, a collector’s item these days – copies of The Committee’s first album are exceedingly hard to find on the open market. Note: Rochelle Richelieu appeared on Laverne & Shirley in the 1976 episode “A Nun’s Story”, directed by Committee founding director Alan Myerson (he directed a dozen of the series’ episodes). According to IMDB, her only other film or TV appearance was in 2008 – credited as Rochelle Winter in Clint Eastwood’s Gran Torino. Alan Myerson, Del Close, Julie Payne, The Committee permalink. ← Ad Shot by My Phone.